Health care crisis: "It's the health insurance companies, stupid." All over the country, people are sending a message to politicians that the huge price increases in health insurance rates and prescription drugs are just not acceptable. In a CBS poll in July, respondents said that health care is the "single most pressing problem" that government should address, and 86% said that the current situation either requires fundamental changes or wholesale rebuilding of the system. 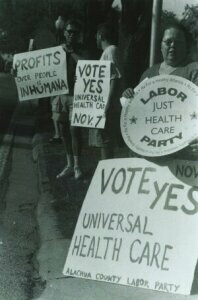 In Illinois, the universal health care "Bernardin Amendment" received 71% of the vote in April '99 in 100 traditionally conservative suburban and downstate communities. In Maryland, an initiative in the state legislature is gaining momentum and has the support of the Commissioner of Health and 74% of Maryland residents polled. Here in Alachua County, the County Commission has placed a non-binding referendum on universal health care on the November ballot. The County has faced steep rises in the insurance they provide to their employees. Last October they switched to Blue Cross Blue Shield hoping to avoid the premium increases they faced with AvMed. This October County employees were informed by Blue Cross Blue Shield that not only were their premiums going up again, their doctor co-pays would double and prescription co-pays would rise to as much as $30 for some prescriptions. "I'll be paying an additional $100 a month just for my prescriptions, adding up to $150 month--just in co-pays," said one county employee. "And this is with supposedly 'good' insurance." Pennie Foster, Vice-president of Gainesville Area NOW, joins other Alachua County Labor Party members in protesting the Humana insurance company, as part of the campaign to let people know a non-binding referendum on Universal health Care is on the ballot in Alachua County. The referendum asks voters if they favor universal health care, taking the money which currently goes to insurance companies and putting it all into one fund which insures everyone. "What people are discovering is that with all the money we spend on health insurance and inflated drug costs, we could cover everyone," says Labor Party Co-Chair Mark Piotrowski. The Labor Party Just Health Care Committee is campaigning for the Alachua County referendum. "The idea that we can get cheaper drug prices in Canada and Mexico is waking people up," said Piotrowski, who recently spoke at the Hawthorne City Commission meeting. "At the meeting, people brought up the question of waiting lines in Canada. But for serious surgery, like breast cancer, patients wait longer here. That's because of the private insurance company pre-approvals and foot-dragging. And then there are those here who cannot get the surgery at all--that's an immoral process of rationing," Piotrowski stated. "The crazy thing is, we're spending the money, it's just not going to care." Universal health care advocates say that if the 25-30% of each health insurance dollar that goes to insurance company profits and paperwork were redirected to care, the entire U.S. population could receive full coverage, including prescription drug coverage and long term care. They point to other countries where private insurance does not exist or is a footnote. "The U.S. spends more per person on health care than any other country--yet we can't provide universal coverage when so many other countries can? Something's wrong with this picture," said Candi Churchill, President of Gainesville Area National Organization for Women, which supports the Universal Health Care referendum. Churchill, a graduate assistant at the University of Florida, says that she has to pay out-of-pocket for physical therapy and can't get care between semesters when the infirmary is closed. There is no health plan for graduate assistants, although the union, Graduate Assistants United, is fighting for this benefit. "Universal Health Care would be particularly helpful to women because we unfairly end up paying for the care for our children." She cites a co-worker with a child who has to pay for care out of pocket for herself and her daughter. "With universal health care, the burden is spread evenly throughout the population, men and women, and insurance companies aren't skimming off the top so we can all get care," Churchill stated. U.S. advocates of a universal insurance system, also known as a "single-payer" system, received a boost last spring when the World Health Organization released an exhaustive comparative study ranking health care systems throughout the world. The U.S. ranked 37, despite spending the most money per person. France, which spends 2/3 of what the U.S. spends per person, ranked first in the study. All industrialized countries except the U.S. provide health coverage to everyone in the country. Advocates for the Universal Health Care ballot measure say it's a way to send a message to the politicians that if they continue to listen only to insurance company lobbyists and contributors, they will face the anger of their constituents in the voting booth. Similar ballot initiatives in three communities in Massachusetts, spearheaded by the Labor Party there, garnered between 70 percent and 84 percent of the vote in 1998. "I don't think the politicians have any idea how mad people are at these insurance companies and HMOs," reflected Dr. Quentin Young, national coordinator of Physicians for a National Health Program, a group of doctors which are pushing for universal health care of the "single-payer" type. Young said that incremental solutions to the health care crisis, "are not the solution, they've been the problem," by creating a patchwork of competing interests, young vs. old, insured vs. uninsured, sick vs. healthy. To create the political will for change, we need to advocate for a system that unites us, Young concludes, "Everybody in, nobody out."